It's late summer in middle America. The sun is low in the sky, casting a golden glow on the shoulder-high corn. There's not much to do in this sleepy little town. Walking downtown, everything is pretty quiet. There are a couple of old men gossiping in the dusty barber shop, a diner that's only open for breakfast and lunch and two competing bars that only boast one or two folks on a typical evening. So when the circus came to town suddenly, everyone was on board. Yes, the big top tent seemed a little worse for wear and all the animal cages were empty except for a couple of bones but entertainment is entertainment and the circus wasn't even charging admission so when the bleary lights rose over the three-ring circus, everyone was in their seats. They were ready for a show. 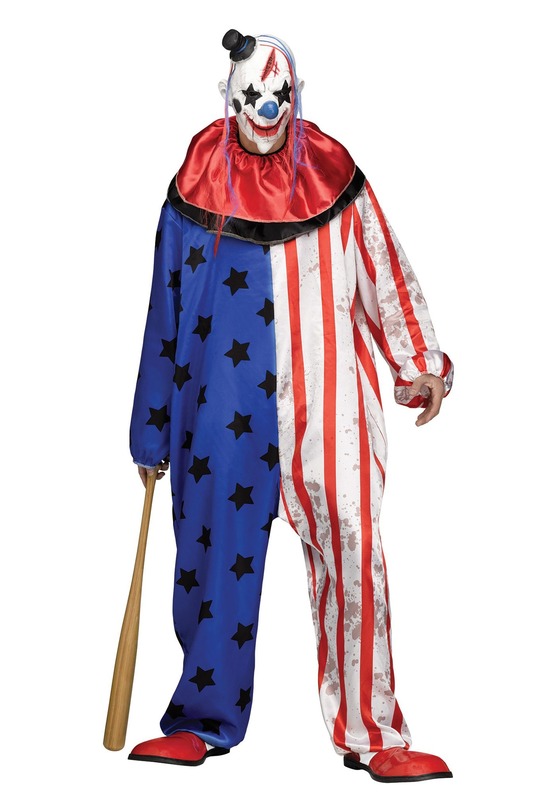 This clown might look a little unhinged but he's still patriotic. 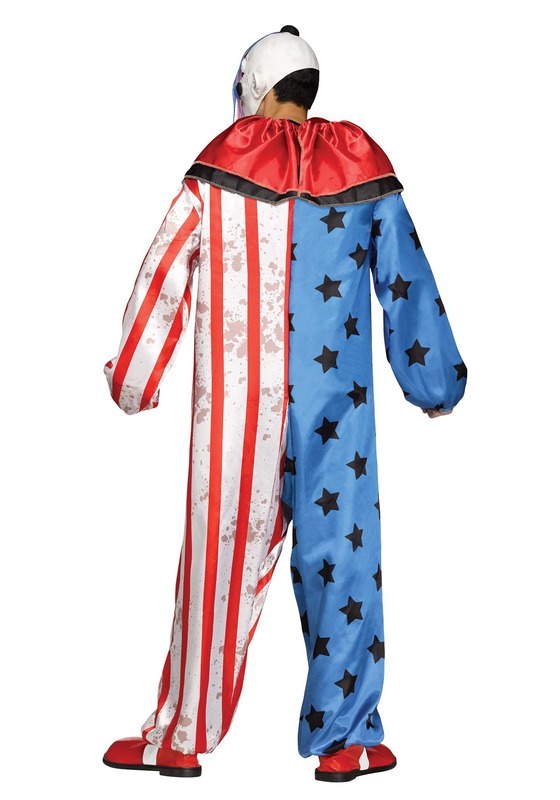 One side of the oversized jumpsuit is a deep blue with black stars scattered across it. The white side is splashed with a mysterious red substance over the red stripes. The suit has a wide collar with both black and red satin fabric. Topped off with a cracked and disturbing clown mask with an attached hat that fits over your head for full coverage, you'll be the last thing people want to see under the big top. There were plenty of unforgettable acts in this twisted circus. The trapeze artists skittered around the ropes like spiders. No one could look away from the horrendous knife-throwing act. But the best part was when they brought in the clowns. The picturesque would never forget their macabre parade. This Halloween, leave a grand impression with this wild costume. When people see your wild antics you're sure to get the last laugh!